This blog makes an effort to be non-partisan, so please select from the above as you see fit. President Obama had an eventful campaign appearance in Philadelphia on Sunday. First, somebody threw a book at him. As you can see in the video below, the book actually sailed by Obama's head, although it's difficult to tell how close it was. 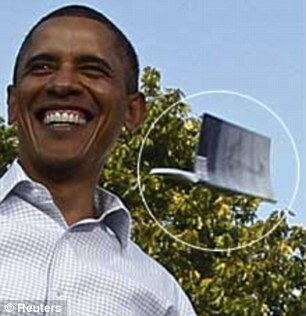 Obama does not seem to have noticed the literary missile, but he may just have been facing the other way. You will not be surprised to hear that the Secret Service interviewed the book-thrower, but agents determined that the man did not mean the President any harm (possibly because it was a paperback). According to one report, a Secret Service spokesman said the man was just an "overexuberant" author who "had written [a] book and hoped the president would read it." I guess that's one way to get a reader's attention. been lots of speculation). This closeup (right) appears to show the back of the book, unfortunately, but maybe there are others. One report gave the overexuberant author's name as "Michael Lohan" (presumably, not Lindsay's father), but there is no work by any such person listed on Amazon, at least. If anyone figures this out, please let me know. At the same rally, a naked man ran through the crowd, apparently as part of a publicity stunt for a website. Reports said that "billionaire and social media guru" Alki David had promised $1 million to the first person who streaked at an Obama rally, provided that the streaker (1) got within visual range and earshot of the President, (2) had the name of a particular website written on his chest, (3) successfully screamed the name of said website at least six times, and (4) was naked. As that same report noted (I'm sparing you the pictures), at least two of those requirements were met. But don't be surprised if a legal dispute is in the making. "We're waiting to review all the video footage and we'll be back with a statement tomorrow," David said. "Whether he was in earshot and eye[sight] of the President is what's being debated right now." To me, that sounds like there may have been some wiggle room in terms of whether the streaker only had to get close enough to be potentially seen and heard by Obama, or whether there has to be some evidence that Obama actually saw and heard him. A requirement to be within someone's "eyesight," at least, would seem to require the latter. I guess the lesson there is to have a lawyer review the terms of any contract before deciding to run toward the President naked. It appears that, unlike the shoe-throwing incident in Iraq where President Bush successfully ducked a couple of loafers, neither of these acts was intended as a protest. The book-thrower just wanted to get his message across, and the streak-arranger just wanted publicity. "You marry a naked person and Mr. Obama together in one event and it's very good," David was quoted as saying, and it seems hard to argue with that. "I have to make it very clear, however," he continued, "that I'm quite a fan of the President. It has nothing to do with him."